Sweat Studio Personal Training in Sunnyvale, CA.- Trainers, Fitness, Kickboxing, Plyometrics, Nutrition, Competitor Training, Figure Competitor, Bodybuilding. After collecting this data and evaluating your performance, your certified professional will be able to create the appropriate techniques and methods based on your fitness goals. All programs include integration with EFIT TRACKER; a dynamic mobile application where you can access details of your nutrition, fitness history, progress, and supportive videos in the cloud. Prices displayed are based a purchase of 20 sessions that are 55 minutes long. Prices may vary. Not all levels are appropriate for everyone. Please schedule an appointment for a free one hour consultation and assessment. 1. STUDENTS 10% OFF- Students currently enrolled into 10 units or more. Must be active for 1 semester/2 quarters within a 12 month period. 2. FREQUENT CLIENT 10% OFF - Clients that complete an average of 10 or more sessions per month. Discount is applied to upcoming package. For most, achieving optimal results may require resistance training 4 times per week and performing 2 to 4 hours of cardio per week. Meeting with your trainer 4 days a week delivers quicker results and your risk of injury is reduced however many individuals may find this program rather expensive. 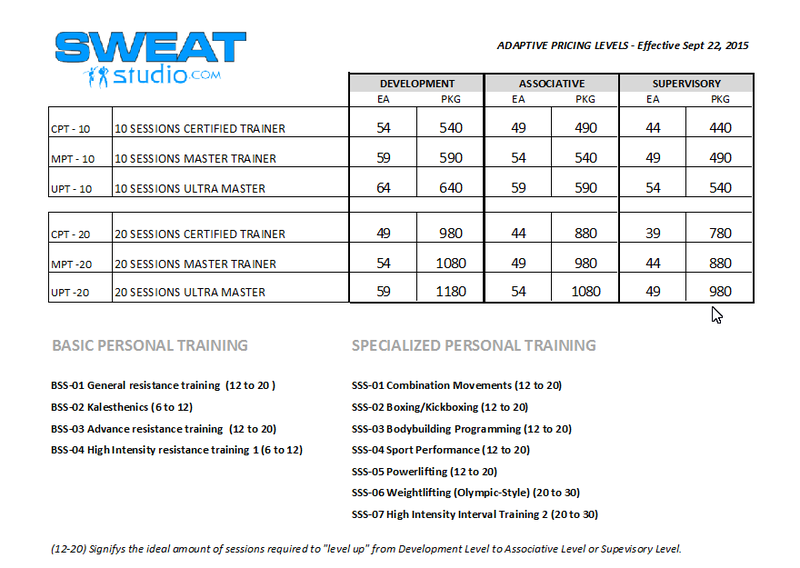 Introducing Hybrid Personal Training Services from Sweat Studio. Supplement sessions utilizing Efit Tracker, your mobile fitness assistant that is integrated with your personal trainer. Train with your trainer twice or three times per week, and perform additional sessions through Video Conferencing to enhance your fitness results. With Efit Tracker, a client will be able to access multiple workout routines from their phone, tablet, laptop or desktop computer. A Efit Professional will assign the appropriate exercises and may attached videos to assist the exercise. You can perform these routines in the comfort of your home, gym, OR at an Efit Express Facility (coming soon). Since 2008, Sweat Studio has been the starting ground for many Figure, Physique and Bikini competitors. As of March 2013, our competitors have achieved 25 trophies in the NPC and INBA competitions. Many of our competitors are over the age of 40. We promote natural competitor ethics. We offer proprietary nutrition consulting. Some competitors may qualify for sponsorships to help pay for the costs of their competition(s).